This book contributes to a broadened theorisation of journalism by exploring the intricacies of African journalism and its connections with the material realities that underpin the profession on the continent. It pulls together theoretically driven studies that collectively deploy a wide range of evidence to shed some light on newsmaking cultures in Africa - the everyday routines, defining epistemologies, as well as ethical dilemmas. The volume digs beneath the standardised and universalised veneer of professionalism to unpack routine practices and normative trends shaped by local factors, including the structural conditions of deprivation, entrenched political instability (and interference), pervasive neo-patrimonial governance systems, and the influences of technological developments. These varied and complex circumstances are shown to profoundly shape the foundations of journalism in Africa, resulting in routine practices that are both normatively distinct and equally in tune with (imported) Western journalistic cultures. 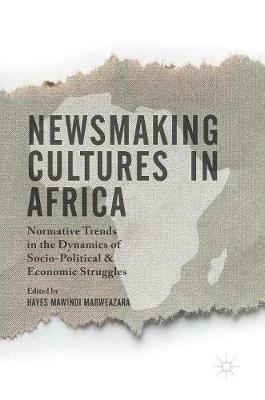 The book thus broadly points to the dialectical nature of news production and the inconsistent and contradictory relationships that characterise news production cultures in Africa.